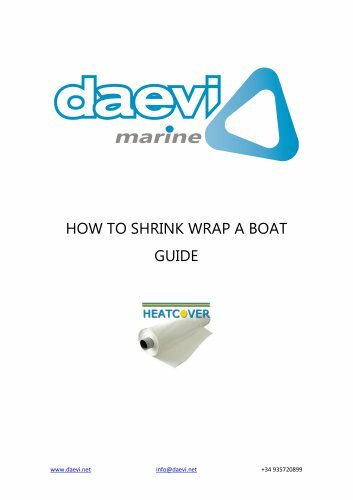 STEP 3 Apply the shrink wrap film to the boat, starting from the top and working your way down to the hull, first on one side and then on the other. Keep the wrap folded in the box until you are ready to use it. Be sure to keep the wrap off the ground. Try to use 1 piece of wrap to cover the entire boat. If you must use 2 pieces, you will need to join them together with shrink wrap tape and heat, which will take extra time. STEP 4 Apply belly bands. Belly bands are straps that wrap around the boat, keeping the shrink wrap film tight. This allows for a tighter seal when the shrink wrap process is complete. STEP 5 Heat the wrap.  Begin at the bottom on 1 end of the boat. Moving the heat gun in a similar motion to spray painting, move up and down from the bottom of the shrink wrap to the rub rail, and work from 1 end of the boat to the other.  Repeat this process on the other side of the boat.  Heat the wrap on the top of the boat. Be especially careful around corners and on any objects that protrude because of a higher risk of tearing in these areas. STEP 6 Check for holes. Chances are, you may burn a few holes in the shrink wrap. Repair any holes with shrink wrap tape, following the instructions for your brand. STEP 7 Wait for the wrap to return to the ambient temperature. Shrink wrap is flammable. You should keep a close eye on your boat until the finished project has returned to the ambient temperature and be prepared to put out a fire in the unlikely event that one occurs.